Christopher Wolf wrote this article. 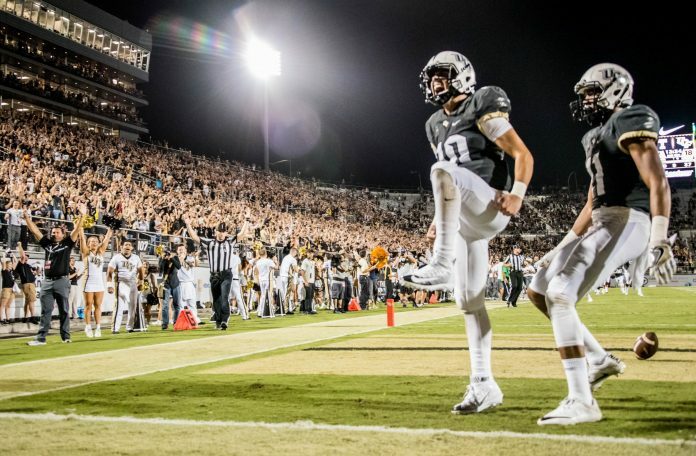 The University of Central Florida Knights (4-0,1-0) defeated the University of Pittsburgh Panthers (2-3, 1-1) 45-14 Saturday at Spectrum Stadium. UCF’s defense played strong, they held the Panthers scoreless throughout the first half. Late in the fourth quarter Pittsburgh’s quarterback Kenny Pickett threw a 58-yard touchdown to wide receiver Maurice French for their only offensive score of the game. The Knights held Pitt to just 272 yards of total offense after getting burned for 36 points and 447 yards of total offense last week versus Florida Atlantic. The Knights came into this game giving up 239 rushing yards a game, and they were able to hold the Panthers rushing attack to only 109 rushing yards on 33 carries. That’s an improvement from last week when they gave up 320 rushing yards versus Florida Atlantic. The Knights pass defense was sharp today only giving up 163 passing yards. Free safety Richie Grant had a second quarter interception, his third of the season. The defense was also able to get to the quarterback for three sacks. Nate Evans finished the game with a career high 11 tackles to go along with his first career half-sack. Randy Charlton also got his first career sack in the first quarter. The Knights had five pass break-ups in the game. This was the third game this season that the Knights defense had five or more pass break-ups. With the interception tonight, the Knights defense has forced at least one turnover in each of the last 23 games dating back to 2016. The Knights defense will be tested next week when the SMU Mustangs come to Spectrum Stadium.